If you had one of the highest IQs in the country, would you use it for the benefit of those around you? In a spectacle that resembles a teenage Italian Job or Now You See Me, this latest picture from director Nattawut Poonpiriya is a nail-biting, pencil-snapping adventure about how a group of intelligent students attempt to perform one of the greatest academic heists. Lynn (Chutimon Chuengcharoensukying) is proving to the world that she is one of the strongest academic prodigies in the 21st century, winning awards and achieving the highest grades. After being offered a scholarship to a prestigious Thai school, she represents her institution at a national mathlete competition, alongside classmate Bank (Chanon Santinatornkul). Gaining a fierce reputation, Lynn is befriended by Grace (Eisaya Hosuwan), who begs her for help in passing their next exam. After a successful cheating attempt, the two girls begin to dream up plans on a larger scale in order to benefit their futures. Along with Bank and Grace’s boyfriend Pat (Teeradon Supapunpinyo), the group risk breaking international law in an attempt to make a sizeable profit and change the direction of their lives forever. 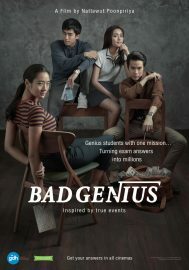 Bad Genius provides a cunning new take on the usual heist movie, with superior intellectuals proving to be the driving force of the project. Through a series of delightful montages with lighthearted comedy, the film welcomes the viewer into a warming embrace through the early scenes, and presents the key plot features in digestible segments. The music follows the tempo of what is being witnessed, but also reminds the audience that at the end of the day Bad Genius is an unrealistic play on the classical heist film and one that is to be enjoyed freely as opposed to vigorously studied. Chuengcharoensukying is brilliant as the socially inept yet heinously bright Lynn. She carries the movie on her shoulders throughout and it is pleasant to witness her character transform from a shy and timid individual into a strong, independent and powerful woman. With the support of a talented cast, including Thaneth Warakuklnukroh as Lynn’s warm and loving father, Chuengcharoensukying makes a striking debut showcasing many of the different acting skills in her arsenal. Despite being ever so slightly too long, the picture is an enthralling piece with an even more inspiring message behind it, showing that when it comes down to a choice between money and friendship, we know where our morals should really lie. Bad Genius does not have a UK release date yet.